Hello everyone! I am releasing today a third update for ScribeUI, for the 2015 edition of Google Summer of Code. This is the final feature update for the summer, which adds a new classifying feature. Data source gives you a list of the data sources in the selected layer. Choose the one you want to use to make classes. Field is the field to classify. 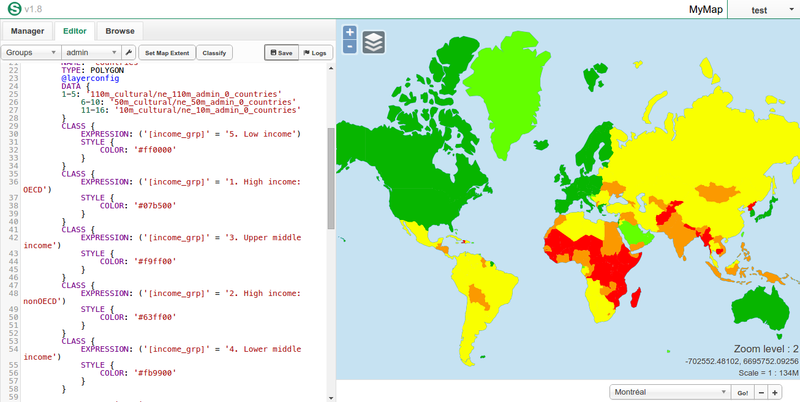 The fields available are those found in the selected data source. Class type is a choice between Qualitative, where all individual values have their own class, and Quantitative, where ranges of values have a class. To add a single color, choose one by clicking on the black square (if you use Chrome or Firefox), or enter its hexadecimal value. Click on the Add button located on the right to add it to the selected colors. To add a range of colors, choose the starting and last colors, as well as how many colors to generate, then click on Add. 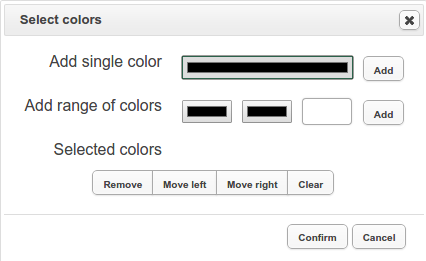 To remove a selected color, press on it in the Selected colors area and click on Remove. To move it, click on Move left or Move right and to remove all the selected colors, click on Clear. When you’re done, press on Confirm in the bottom right of the popup. When you’re done choosing colors, you will go back to the classify menu. To generate the classes, press on Confirm on the bottom right.